This past week marked six years since George Allen Smith IV disappeared from Royal Caribbean’s Brilliance of the Seas. Mr. Smith’s disappearance, and the manner in which Royal Caribbean chose to handle the incident, brought much needed attention to the cruise industry. The events which followed Mr. Smith’s death led to five Congressional hearings into disappearances and crimes on cruise ships, culminating in the passage of the Cruise Vessel Security and Safety Act in 2010. Our firm represented Mr. Smith’s wife, Jennifer Hagel. She hired us to obtain answers to what happened to her husband and to seek compensation for his death. Starting on Monday, I’ll publish an article each day about the facts and circumstances surrounding the ill fated cruise. What happened on the night in question? What did the cruise line do when Mr. Smith was discovered missing from the cruise ship once it had reached the port of Kusadasi Turkey the following morning? Did Royal Caribbean voluntarily provide any information to the families of Mr. Smith and his bride Jennifer Hagel for the next several months? What role did the media play in maintaining focus on the story? What led the families to hire maritime lawyers? How did the cruise line respond? I’ll address these issues. I’ll talk about hiring Dr. Henry Lee and bringing a team of forensic experts and detectives aboard the cruise ship to try and find answers. How did the legal cases turn out? What is the status of the FBI investigation today? Most importantly, has there been justice for George Smith? 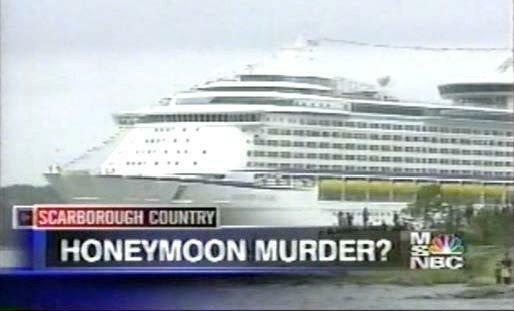 Media Frenzy Follows Case of "Missing Honeymooner"
The International Cruise Victims Organization Is Born! Larry King Live & the "Missing Groom Mystery"
Do you have information which may solve this case? Please let us hear from you.